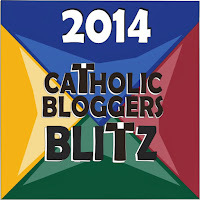 I’m co-hosting and participating in the annual Catholic Bloggers Network, Keep LOVE in LENT Blog Link-Up 2014! We'll be sharing tips, stories and experiences that will help us focus on Lenten sacrifices, prayer and good deeds and how to carry them out with LOVE instead of a GRUMBLE. 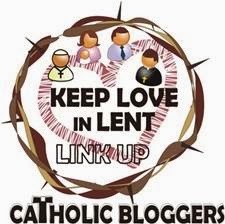 Are you a Christian blogger who'd like to share Lenten ideas? You're welcome to join in! Please scroll to the linky at the bottom of my post and visit the other hostesses' too so that you can join in if you'd like! Next week we will be making our annual crown of thorns out of salt dough and you can find the link at Catholics United for the Faith (CUF). Click HERE to find recipe and other Lenten resources from CUF. Each time our children and my husband and I make little or big sacrifices during Lent, we will pull out a toothpick to remove Jesus' thorns from his crown. Then just before Easter, our children will paint the thorn-less crown gold and glue jewels on the crown to represent that Jesus our King has risen! The decorated crown looks lovely on the Easter table. Here is a picture of a crown we did a few years ago. I got the bean jar idea from Holy Heroes Lenten Adventure a few years ago and we decided to try it in our home during Lent. Our family loves Holy Heroes Lenten Adventure (and Advent Adventure) and you can register your email for free to receive weekly links all about Lent. I have learned so much along with my children! 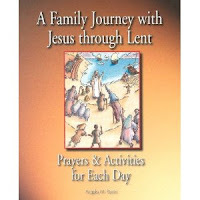 Throughout Lent our family will be reading once again, A Family Journey with Jesus through Lent by Angela M. Burrin published by The Word Among Us. We really enjoy this book as it is written to promote family prayer and the characters in each story for each day of Lent are children and families that live in Jesus' time. Then after each story that is based on scripture there is a "Jesus, Speak to Me" section where it is written as if Jesus is speaking to us. This is a wonderful book that has been great to read as a family each day during Lent! Or we might try to read Amon's Adventure: A Family Story for Easter. We have really enjoyed the Advent versions of these family read alouds! Speaking of great books to read during Lent, Patty over at Reasons for Chocolate has this great post where she lists all the wonderful books her children will be reading during Lent. Many years ago, when my older two children were little I had them color printable stations of the cross. I then glued them onto construction paper and each Lent we tape them up in order on our dining room wall. Each Friday as a family we pray through the stations of the cross with these. I can't remember where I got these particular coloring pages, but here are some other printable stations of the cross that children can color. Several years ago, I found a simple presentation of the Stations of the Cross for kids 10 and under and this is what we use to say the stations during Lent. It was in The Word Among Us Lenten Family Edition, Lent 2006 and HERE is a link to part of the article if you would like to review it. Only subscribers to The Word Among Us can view this kid's version of Stations of the Cross in its entirety, however. We have also made Stations of the Cross bags and pretzels for Lent in the past. 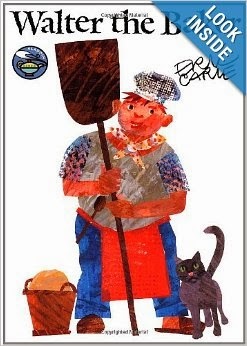 I hope to read the book Walter the Baker by Eric Carle again to go along with our pretzel making like in year's past! 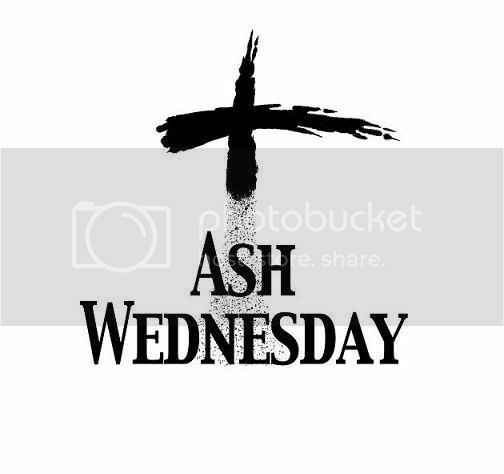 On Ash Wednesday and during all Fridays during Lent, Catholics abstain from eating meat as a form of fasting and penance. For more information about the history of Lent, I would encourage you to read What are the origins of Lent? Did the Church always have this time before Easter? In the article I learned something new when it stated, "The word Lent itself is derived from the Anglo-Saxon words lencten, meaning "Spring," and lenctentid, which literally means not only "Springtide" but also was the word for "March," the month in which the majority of Lent falls." I'm always on the look out for meatless dishes during Lent and this Seafood Spaghetti dish is easy and delicious. You can find the recipe at my blog post HERE. I really like Jen's Roundup of Lenten Resources post HERE that includes lots of links to meatless meal ideas. I hope to try some new dishes from her list. Thanks Jen! I linked up my Seafood Spaghetti recipe at Beth Anne Best's 2014 Lenten Meal Plan Link-Up! 2. Copy and paste the hostesses' blog names/links to the bottom of your post so that your readers, who may also blog, can join in the fun and link up. 3. Please follow your hostesses' blogs and like our Facebook pages. As a courtesy, we ask all who participate in the Keep Love in Lent link up to click to all of the hostesses and follow us. 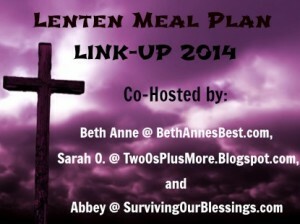 We also encourage this so that you don't miss updates about the Lenten Link-Up! And besides, we'd love to stay in touch regularly! 4. Mandatory Follow Frenzy~ Visit, enjoy, be inspired by and comment on the blogs in your "group!" The Keep Love in Lent Link-Up is not a link and run event...sorry, folks! A requirement of participation is our follow frenzy. * Once the linky closes on 3/10/14, the admins of the Keep Love linky will email ALL who've linked. We will provide you with info regarding the "group" to which you are "assigned." * You are asked to visit the blogs in your group ( there will be approx 10-12 ) and leave meaningful comments within a given time frame. 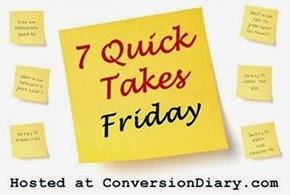 In this way, traffic to all blogs is increased and we all benefit from each others' work! May you have a blessed and Holy Lent! Thanks! This is so fun to host this Lent Link Up with you and the other wonderful ladies! I loved your list of resources as well! So glad to link up to you! So many great things to do and ideas for Lent, so little time :) Have a blessed Lent Jen! Thanks for sharing this wealth of ideas! I signed my 4th grader up for the Holy Heroes; first time. Thank you for sharing your Lenten Traditions...especially the meatless Meals & Lenten Meal Plan Link-Up! A blessed Lenten season to you and your family! Hi Valerie at "Hand-Maid With Love"! Thank you for your visit and comment! I'm glad you registered with HH! Such a blessed resource! Enjoy your meatless Lenten meals also! Have a blessed Lent! Hi Meredith! Thank you for your nice comments. Those colored stations are oldies, but goodies and I probably should have my younger children color some too :) Thanks for checking out the cakes too! Some of them are definitely labors of love! :) Have a blessed and fruitful Lenten season! A family devotional for Lent is such a great idea! My husband and I do this every year and it has been such a source of strength for our marriage. We have struggled with infertility for the length of our marriage, but if God one day blesses us with children, this is most definitely a practice we feel led to continue with our "whole family". When my husband and I were newlyweds (back in 1997!) we also did devotions, especially during the Advent season. Now these devotions have grown and evolved with our growing family. May God bless your faithfulness with children of your own so you can pass down your faith to them! Thank you for visiting and commenting! May your Lent be fruitful and blessed! I've seen a lot of sourdough bread crowns on the Internet this past week; yours is the best--really beautiful. What a lovely tradition for your family. 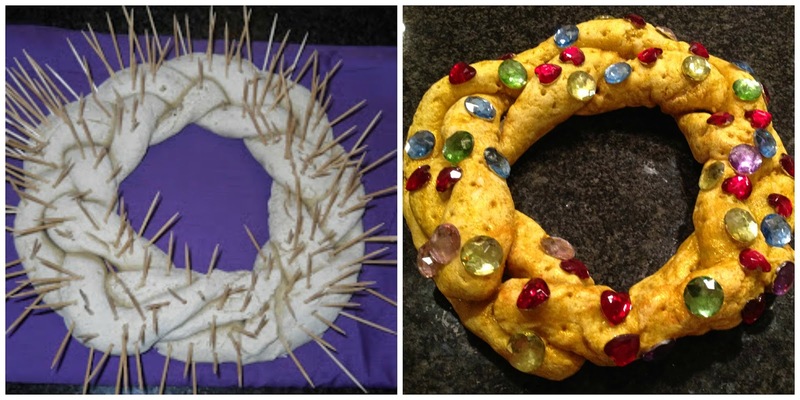 We've enjoyed doing our salt dough crown of thorns each year for several years now...it's a fun and meaningful tradition for sure! Thanks for stopping in and commenting! :) Have a blessed Lent!